While 2016 saw the destabilization of the left and the apparent rise of conservative politics, 2017 has seen a widespread backlash against this trend. In Britain the conservative party called for early election to secure more unified control of Brexit, only to lose seats in Parliament. This mistake, easily understandable among tenderfoot politicians, is, however, hardly justifiable in such an old and battle-scarred party as the English “Tories.” Meanwhile, in the U.S. the Trump presidency is harrowed by a leftist media obstinately incapable of reporting on his successes and feverishly dedicated to his destruction, even at the cost of their own credibility. As a climax to the turn of events these past six months Europe has experienced a seminal moment: France has elected Emmanuel Macron. On the subject of the French election, many were tempted to believe Marine Le Pen would win in much the same way Trump or Brexit did: as conservative underdogs that the polls failed to take seriously. What this mindset failed to take into account, however, were the stakes. While in America it was a contest between two political parties and in Brexit it was the issue of a member State leaving a bigger group, in France it came down to the very existence of the EU itself. With the UK’s exit, France is the last large member nation besides Germany to hold significant power in the EU. If France would leave – as Marine Le Pen had promised – the EU could not be maintained. It would be reduced to Germany and some satellite States. The election in France was thus less a Trump/Brexit scenario than it was a fight for the life of the EU. 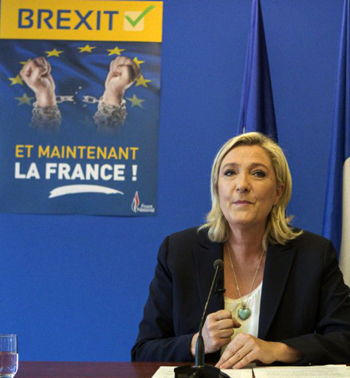 Thus, the apparent prospect of a Marine le Pen presidency evaporated like a mirage, leaving the emboldened EU with a new sense of authority to impose multicultural globalism on its member States. France has ushered in a second wind for the EU. In political terms the French electoral race was astonishing. None of the traditional parties had a candidate in the final round of voting that took place this past May. Marine le Pen rallied support under the banner of France first, no to immigration and no to EU infringement on French sovereignty. 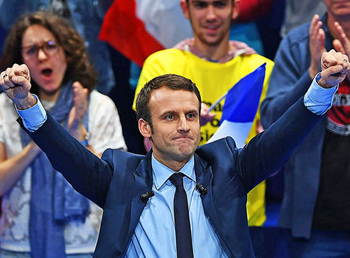 Emmanuel Macron formed his own party, disavowed the current political establishment and, ultimately, carried himself to a resounding victory both in the presidential election and in the Parliament on the platform of being a supposed centrist. In reality Macron is no centrist. Politically speaking centrism is a moderate position that attempts to take the best of the left and right without falling into the political platform of either side. However, prior to his presidential campaign the supposedly centrist Macron was actually a card-carrying member of the French Socialist Party (2006-2009). He then went on to exercise the function of Finance Minister for socialist ex-President François Hollande until 2016. While he has several conservative views on fiscal matters, he also advocates for a combined Eurozone budget. This “exchange zone” would establish a shared EU economy where the failing economies of poorer States are propped up by the more prosperous members. The Eurozone budget would all fall under the power of an EU minister, effectively establishing Socialism on a pan-European level and tightening the economic strings that bind the supposedly sovereign member States together in the carrot-and-stick relationship of the European Union. As an ideology Socialism is, thus, deeply ingrained in Macron’s education and experience and it continues to find expression in almost all of his policy. When it comes to social issues the idea that Macron is a centrist becomes even more untenable. The new French President is stridently pro-homosexual, favors abortion, is accepting of Muslim immigration into Europe, has called climate change skeptics “deeply wrong” and has claimed that he will lead the fight against “illiberal democracy” (that is to say, against Hungary and other Eastern European countries that retain any shred of conservative sentiment). Even his family life is aberrant, with his wife Brigette Trogneux being his ex-teacher, 24 years his senior, with whom he fell in love in high school. She was already married with children, and today she has seven grandchildren. 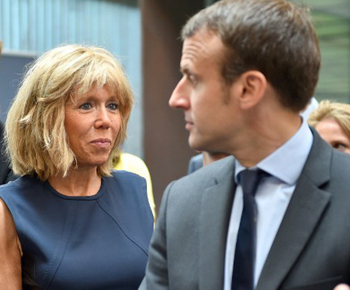 Macron has no biological children. During the presidential campaign, he said he wanted his wife to have a prominent role in the State and he wanted to be recognized as a feminist by women. Considering these social criteria, as well as Macron’s fervent support for the EU, any attempt to call him a centrist becomes an act of delusion or duplicity. The fact that the media is so successfully peddling this lie is less a testament to Macron and more a sign of the ongoing ideological offensive of the political left and their subservient media outlets. Macron is socialist in nearly every aspect of his person and policy, yet somehow he is still presented a centrist. While most news outlets would have their readers believe in this centrist myth in reality this is an indication that the modern Left has had to disguise its socialist colors in order to be accepted by the electors. Despite this mythical image, the reality is that this so-called “centrism” is part of the hypocritical maneuver that the political Left has made to wash itself of its own negative image. Macron’s “centrism” is an act of duplicity meant to normalize all of the abhorrent victories of a socialist society. In the war of words it is a master-stroke. As the pro-EU candidate running against the anti-EU Marine le Pen, Macron has been heralded the savior of Europe. If Le Pen had won and taken France out of the EU it would leave only Germany as arbiter of the smaller satellite States, an awkward situation for an EU that pretends that there is at least some equality of power among all its 28 member-States. Macron is a true believer in the ideals of the EU. With no small hint of venom he stated that Britain should be made to suffer severe consequences for Brexit and that punishing the UK will serve to discourage any other country from leaving this grand “European dream.” At his election celebration he walked on-stage to the strains of “Ode to Joy,” the anthem of the European Union. Macron heralds a future of cooperation between France and Germany. This means increased centralization of financial power into the hands of the EU and increasingly severe consequences for member States who attempt to disrupt or impede the integration of European nations into a supra-national Leviathan. Macron’s election has been heralded as a triumph by the adulatory media despite the record breaking low voter turnout. Historically France has enjoyed fairly high voter turnout, yet this past presidential election of Macron saw the lowest percentage of voters since 1969. It was also reported that many who voted for Macron were not supporting him, but were simply voting against Le Pen, whom they disliked more. The French parliamentary elections that followed were even worse. Yes, Macron’s newly birthed En Marche! won an absolute majority in the Parliament, but this mandate is marred by the lowest voter turnout in the history of the Fifth Republic. Hardly 42% of the French voted! In a country that has enjoyed much higher voter turnout in the past, this leaves Macron’s victory sounding deceptively hollow. With his slick hair and young appearance, this man who is devoid of morals and ready to dance to the tune of a 21st century globalism is the ideal icon to revive a sagging multicultural Socialism. He is a hollow man and one that the international media unabashedly fawns over at every opportunity. Because he is a “centrist” any meaningful objection is labeled “radical” or “politicized” and is summarily discarded. Macron is the neophyte poster boy of the new European order. With him France has stubbornly diverted its wavering and resolutely set itself on the path of integration, globalization and possibly the very end of national sovereignty in Europe. 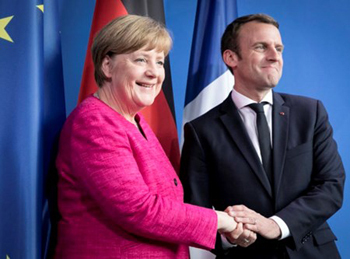 France and Germany are now set to drag Europe into the deepening mire of overwhelming immigration, debilitating political correctness, and compromised national sovereignty that is touted as “the great and glorious” European Union. Is Nazism a Movement of Left or Right?